Yokogawa Electric Corporation announces the development of the GX90XA-10-V1 high-voltage analog input module. This new product will be released on July 9 as part of the OpreXTM Data Acquisition family of data collection and control solutions. The GX90XA-10-V1 module enables Yokogawa recorders and data loggers to be used in performance evaluation tests for the development and production of electric vehicles (EVs), fuel-cell vehicles (FCVs), and plug-in hybrid vehicles (PHVs)* as well as the on-board batteries used in such vehicles. Such tests typically require the measurement of multiple channels under high-voltage conditions. Recorders and data acquisition systems (data loggers) are used on production lines and at product development facilities to acquire, display, and record data on temperature, voltage, current, flow rate, pressure, and other variables. Yokogawa, a world-leading manufacturer of recorders, offers recorders and data acquisition system solutions for the collection and control of data as part of its OpreX Data Acquisition lineup. 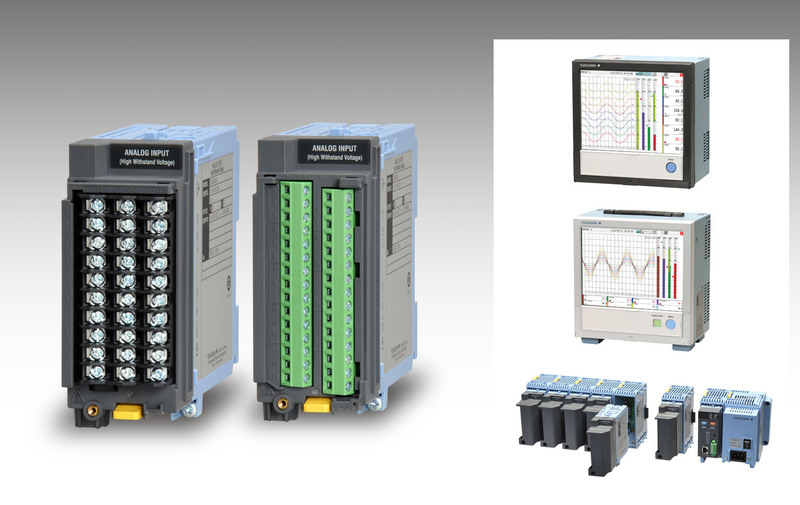 To meet market needs and comply with industry-specific requirements and standards, the company continues to add new I/O modules with enhanced functionality to this lineup. For the development and production of EVs, FCVs, PHVs, and on-board vehicle batteries, performance evaluation tests involving the measurement of voltage levels in multiple battery cells must be performed. The batteries used in such vehicles can have hundreds of interconnected cells, and the voltage levels at all these points must be measured simultaneously. The test devices that are used must be capable of withstanding voltages of several hundred volts (high common mode voltage) that are typically applied between the measuring terminal and the ground. The high-voltage analog input module developed by Yokogawa allows the measurement of multiple channels under high-voltage conditions and is thus well suited for the development and production of rechargeable batteries as well as vehicles that use those batteries. The GX90XA-10-V1 analog input module can be mounted on the following OpreX Data Acquisition products: GX series touchscreen paperless recorders, GP series portable paperless recorders, and GM10 scalable modular data loggers. The GX90XA-10-V1 has two layers of insulation and can withstand a common mode voltage of up to 600 V ACrms or 600 V DC, and is capable of sampling data at intervals as short as 100 ms. With the GX and GP series recorders, the module can accept up to 450 inputs; with the GM10 data loggers it can accept up to 420. With capabilities such as these, the GX90XA-10-V1 is ideal for use in tests on production lines and at development facilities that evaluate the performance of vehicle batteries with multiple channels and under high-voltage conditions. The module is also ideal for evaluating the high voltage levels used in the electrolysis process in electrolysis tanks. The GX and GP series recorders and the GM10 data loggers are all compatible with the Ethernet LAN standard and the Modbus communications protocol, which are both widely used in industrial networks, and thus can connect and communicate with upper-level control systems and third-party products. When the GX90XA-10-V1 is mounted on a GX or GP series recorder or on a GM10 data logger, voltage measurement data can be monitored from a host system, and the collected data can be uploaded to a database for sharing. OpreX is the comprehensive brand for Yokogawa’s industrial automation (IA) and control business. The OpreX name stands for excellence in the technologies and solutions that Yokogawa cultivates through the co-creation of value with its customers and encompasses the entire range of Yokogawa’s IA products, services, and solutions. This brand comprises the following five categories: OpreX Transformation, OpreX Control, OpreX Measurement, OpreX Execution, and OpreX Lifecycle. The GX90XA-10-V1 high-voltage analog input module is part of the OpreX Data Acquisition product lineup, which is aligned under the OpreX Measurement category. The OpreX Measurement category includes field equipment and systems for highly precise measurement, data collection, and analysis. With this brand, Yokogawa will deliver integrated solutions that address specific needs and support its customers in their efforts to transform and grow their businesses. * The abbreviation PHEV for plug-in hybrid vehicle is also widely used in the industry. Founded in 1915, Yokogawa engages in broad-ranging activities in the areas of measurement, control, and information. The industrial automation business provides vital products, services, and solutions to a diverse range of process industries including oil, chemicals, natural gas, power, iron and steel, and pulp and paper. With the life innovation business the company aims to radically improve productivity across the pharmaceutical and food industry value chains. The test & measurement, aviation, and other businesses continue to provide essential instruments and equipment with industry-leading precision and reliability. Yokogawa co-innovates with its customers through a global network of 112 companies spanning 61 countries, generating US$3.8 billion in sales in FY2017. For more information, please visit www.yokogawa.com. For industrial and lab applications, the GM10 offers Bluetooth wireless connection and modular I/O that offers accurate and reliable measurements. The GM10 also supports 920 MHz band wireless communication. SMARTDAC+TM GP10/GP20 is a paperless recorder that provides intuitive, human-centric design, web-enabled functionality, and scalable architecture. SMARTDAC+ GX10/GX20 is a multi-point touch screen recorder that provides intuitive, human-centric design, web-enabled functionality, and scalable architecture. The GX20 also supports 920 MHz band wireless communication.